Classic yachting enthusiasts well know to what extent W. Fife boats all have a common denominator, a feature that distinguishes them at a distance, even only in silhouette, a certain something that other designers' hulls may or may not possess in spite of their excellent toughness, speed and seaworthiness but that Fife boats have with systematic constancy: that something is elegance. And to the great pleasure of those who love these pure, soaring lines, another Fife joined the fleet at the last racing season: Moonbeam IV. The W. Fife designed Moonbeam III has been raising on the French Riviera for years and this may induce us to wonder about the genesis of the Moonbeam dynasty. In fact they all belonged to the same owner, the London barrister Charles Plumtree Johnson who settled in Scotland and, at the end of the 19th century, purchased a boat already designed and built by the famous architect W. Fife, the Moonbeam 1858. 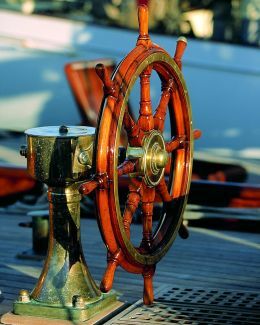 The evolution of Johnson's sailing requirements - chiefly cruising - led to a second boat, built in the south of England by White Brothers to Sheperd's design. He sailed this yacht until the call of the Clyde took him back to the Scottish shipyard. Moonbeam III , known as "of Fife" to distinguish her from the previous vessel, was launched in 1903 and in her first season covered no less than 5000 miles! After III, of course, came IV! 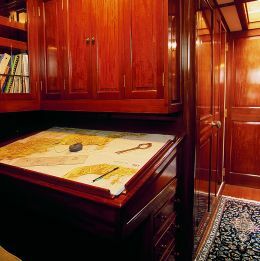 This time Johnson ordered a yacht that was not only comfortable for cruising but also fast for racing, without tonnage restrictions but of such size as to compete in the Big Class. 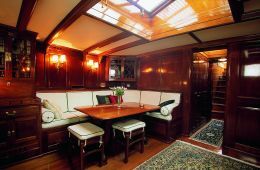 Completed as early as 1914, Moonbeam IV spent long years in a boatshed until 1920 when, with the war wounds healed, George V officially announced the resumption of yachting activities, refitting the royal yacht Britannia and taking her to Cowes Week. 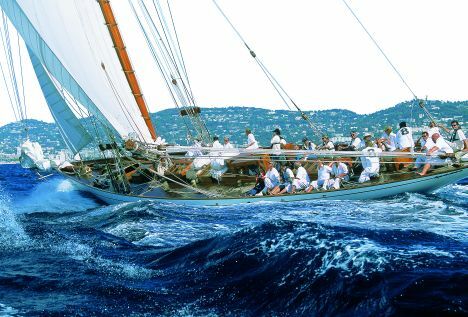 The debut of Moonbeam IV was astonishing: she immediately won the King's Cup, a performance she would repeat in 1923. 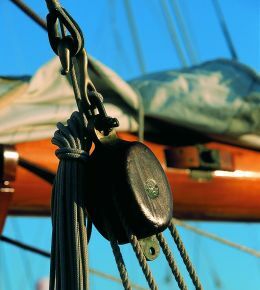 Her change of ownership to Henry Sutton also marked a change of rig from fore-and-aft/Marconi to a hybrid in which the gaff- topsail, instead of being rigged with its own peaks, was bent onto the topsail mast which was not, as normally, off-centre but aligned with the lower mast, with the result that there was more canvas aloft and more rigidity. 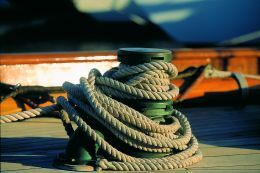 This always required someone on the mast when hoisting sail. 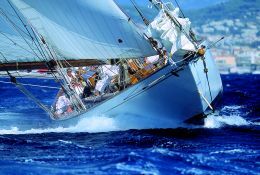 The boat continued racing until the 30's in various handicap races and at Cowes, always with a good showing. In the immediate post-war period, with ketch rig, she was in the Mediterranean, converted for cruising, a fate common to her sister ships such as Cambria, Candida, Astra, Lulworth etc. In 1950, bought by prince Rainier of Monaco and re-christened with the family motto Deo Juvante (with God's aid), she took the sovereign and Grace Kelly on their long honeymoon around the Mediterranean. In 1960 an Italian owner, Count Scotti, restored her original name, gave her two new engines and saved the original fittings as much as possible. There followed a long period of decline in which this thoroughbred went downhill and was used for charters in the Aegean. Here in 1995 she was discovered and bought by John and Françoise Murray. 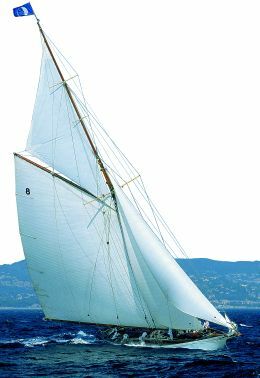 After an initial period during which the great ketch was used without any restoration whatsoever - for example at the 1996 Régatés Royales - the idea slowly took shape of a philological rehabilitation. John Murray made an unusual choice for a European owner, but a fairly logical one for someone like himself who knows the world and how to sail it. To restore a teak vessel one goes to a country where teak is grown. Where there is a favourable price-work ratio and, not least, where both wood and metal are still worked manually in the old way (Moonbeam's framework is in steel). The voyage from Antibes to Burma took three months but in spite of bad weather there were no serious setbacks. At the Myanmar Shipyard, following complete dismantling, it was noted just how well preserved the vessel was: the copper sheathing of the quick-works - a system that would he reutilised - permitted recovery of about 95% of the planking, teak planks 18 metres long and 5 centimetres thick. Having fixed the metal framework to a temporary structure to avoid any deformation, several steel frames were replaced at the stern. Approval from Lloyd's gave the go-ahead for works which continued with the substitution of a few planks, steam-bent and fixed with bronze rivets, and the laying of metal beams and of the new teak deck on a cedar base. 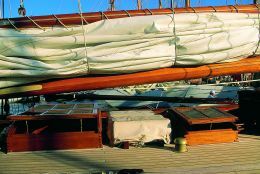 Following the original designs the unusual fore-and-aft/Marconi rig was reconstructed, with shrouds and running rigging sent to the yard from the USA. The sails too, apart from the material employed, remained identical to those of 1927. The interior layout as envisaged by W. Fife was maintained, together with a similar sobriety of furnishings. 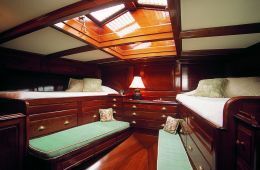 Setting out from the bow we find the crew's quarters, a functional galley, the mess-room, a connecting room with two opposite twin bed cabins and private bathroom plus the cabin known as "des dames" where two raised beds set against the bulkhead are separated by a bedside cabinet and flanked by two sofas and a dressing table. The fairly spacious bathroom is also equipped with a tub. The wood used is lightened Burmese padouk, taken from a single tree trunk in order to achieve chromatic homogeneity and waxed in accordance with ancient techniques: the result is spectacular! Obviously all the modern electronic devices have been added for safety under way, not to mention the indispensable fridges, generator and conditioner, while the two Rolls Royces have been replaced by a single 350 HP engine. 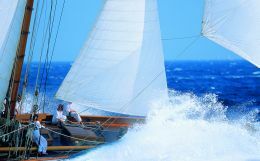 Moonbeam IV, whose time is divided between luxury charters and the owner's love of sailing, has been one of the most admired stars since she arrived on the racing circuit last year. Her arrivals at the mark, with the rhythmic chant of the seven trimmers getting synchronised to haul on the great mainsail, are famous. Then another four of the crew at the lower handwheels and three at the upper, five bowmen, the skipper and the tactician: all in all a multitude, and frequently with a high percentage of pretty girls who work frenetically to make the old Moonbeam, now reborn in body and soul, shoot along and possibly win.